Pagina iniziale Podcast Lifestyle Magic - Where's Your Head At? Tom is joined by bestselling author Matt Haig, whose brilliant books Reasons To Stay Alive and the brand-new Notes On A Nervous Planet discuss anxiety, social media, and ways we can all look after our mental health. Tom and Lynn discuss anxiety, what that word really means, and how it can affect all of us. Tom Price takes a look at the importance of sleep and exercise in our lives and the impact that it can have on our mental health. 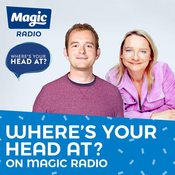 Magic has joined up with radio stations and magazines across the UK to support the Where's Your Head At? awareness campaign - find out more at wheresyourheadat.org. 01 - What Is Mental Health? Su Magic - Where's Your Head At?